Developments taking into account the motorization of cannons against the offensive car in 1938. • Actual consumption a.p.h. to 100 km in liters: road (asphalt, concrete, cube) 65 liters, county road 67 liters, field and forest roads 111 liters, pastures and flat terrain 111 liters, heavy terrain and muddy obstacles 155 liters. • Maximum speed in kilometers: roads (asphalt, concrete, cube) 50 km / h, district road 40 km / h, field and forest roads 30 km / h, pastures and flat terrain 30 km / muddy obstacles 18 km / h. The tests were performed with the gun loaded and buried. • Average speed km / h: roads (asphalt, concrete, cube) 38-40 km / h, district roads 30-35 km / h, field and forest roads 25 - 30 km / h, heavy terrain and obstacles 12 - 15 km / h. Examinations were performed only with a loaded gun. 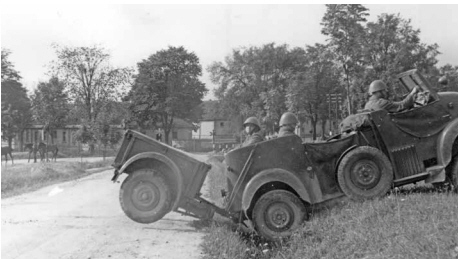 Mobility, dexterity and climbing of the vehicle with a loaded cannon: The vehicle easily overtakes terrain and slopes - tested only on a slope of 40 degrees, easily moving on a dry and humid oranica. Also, without great difficulty in this oranges, it is spinning back and forth. Track belts do not fall. Testing a 500-meter ride in the plane (the oranica on the slope was not available), the vehicle took the track in two and a half minutes, that is 12 km / h, dry oranica. Grain passage due to the season was not implemented. Walking on a 500-meter-long sandy road was conducted on the so-called Russian Route at Milovice Military Training Ground with a cannon loaded and towed. Hourly speed reached 26 km. Riding without a solid bottom was not performed.